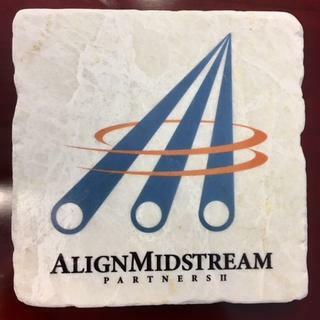 Tumbled stone coasters make a stylish and elegant promotional statement. Great for corporate events, banquets, wedding favors, or executive gifts. These heavy-weight 4" x 4" natural stone coasters are made of solid snow white Marble with a smooth finish with rounded edges. Recommended for imprints that allow the white surface to show through. Your customized 4-color process design is printed directly onto the stones for a durable imprint. Cork-backed to protect furniture. Color matched our logo perfectly! Coasters look gorgeous on our conference room table and desks. Will definitely order more in the future as needed. Hi Lauren, thank you for your positive review! We are so glad you are pleased with the coasters and appreciate the great picture. We look forward to working with you again on your next project! Hi David, thank you for your positive review! We are very happy the quality was a match for you. It's sometimes difficult when ordering from a website to know exactly what will be received and we appreciate your trust in our handling this project and we look forward to working with you again on your next project! Although it cost a little more than we wanted to pay, they coasters look very nice. They have a nice shine to them and they matched our color Logo correctly. Hi Mary, thank you for your review! We are so pleased to hear you're happy with your order, and we look forward to working with you on your next project!